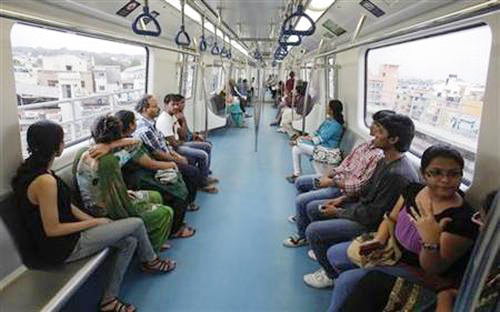 Mumbai Metro is the talk of the town these days. Built to reduce traffic congestion in this severely over-crowded city, it also supplements the existing railway line. The Mumbai Metro has become a pride of all us Mumbaikars. The system began its operations from 8th June. 3 weeks and I was yet to experience this Mumbai wonder. Finally the most awaited day arrived. On Sunday morning, armed with all the gear, we set out for this wonderful Metro experience from Marol Station to Versova. Once upon a time, Marol was my place of work, commuting by auto. Calling it a “Station” now was something incredible, a bit funny but a lot to be proud of! Ticket counters are manned by smart-looking staff with smart uniforms. Nice sight to see! Tickets are pocket-friendly. The station is loaded with security. There are also ticket-vending machines that make life so much easier. Everything is so well-done. Platforms are clean, bright and well-maintained. Coaches are AC with automatic open-shut doors. The seating is comfortable with a lot of space for standing commuters. Couples formed a major part of the crowd. Sharing ice-creams and sandwiches, spending their couple-time together in a train, travelling back and forth. It gives a different perspective of love altogether. Guess, couples are either tired of theatres, parks and seasides or they’ve become innovative and adventurous with love. The sad part is, despite automation, there is still a lot of manual work – like extra-long queues at the exits. A guy has to stand at the exit points, check the tickets and then let the people out. This causes over-crowding, pushing and delays. Also there are long queues at the ticket-counters. A person needs to stand at the auto-exit points to guide people and collect coupons. Being a die-hard optimist, I am sure things will fall in place gradually. People will learn and support and so will the operators of the Metro. After all this is just the beginning. More than a lac people travel in the Metro. It has cut down a lot on travel time, auto bills and made commuting easy. Above all, it has brought smiles on a millions of tired faces. My ride in the Metro was a joy-ride…literally! I loved every moment of it, every bit of the sight from those large glass windows…from Marol to Versova. A view from the top. A view I’d never seen before. Felt like a tourist in my own city. The Metro has indeed added a new page to the history of Mumbai.